SBS Transit Bus Service 400 is a trunk route serving the Marina Bay area, running from Shenton Way Terminal and looping at Marina Gardens Drive, via Marina Blvd. 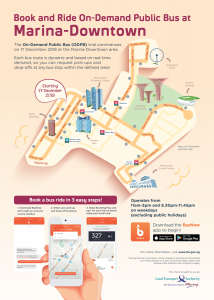 It is a vital bus service link between Marina Bay MRT Station and Marina Barrage. 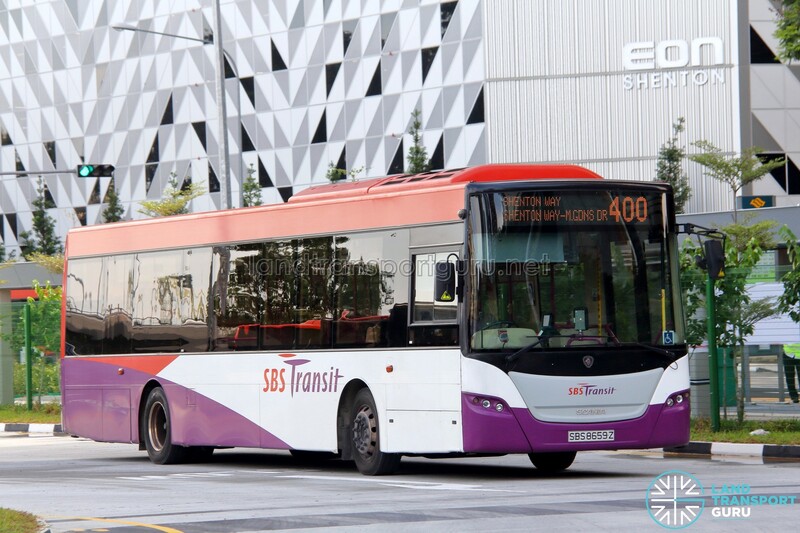 Service 400 operates at a reduced frequency of 40 minutes per bus during Weekday off-peak hours, as part of the On-Demand Public Bus trial. 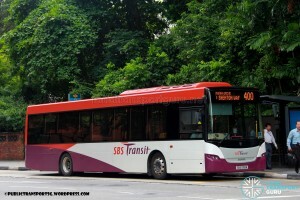 Service 400 serves the Marina South area with connections to Marina Bay MRT and Shenton Way. 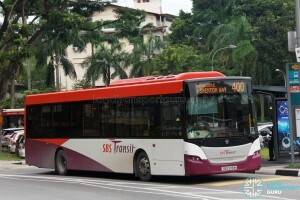 Before the mass redevelopment of Marina South, much of the area was a park and Service 400 provided the bus connections needed. In recent years, the construction of the Circle Line Extension and Downtown Line have diminished the role of Service 400 as a crucial connecting route in the Marina South area; however it still receives demand from shuttling passengers between Tanjong Pagar, Downtown and Marina Bay MRT stations to the Marina Barrage and Gardens by the Bay (Bay South). 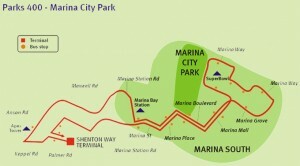 Formerly designated as a Parks service in 2005 (serving Marina City Park and Marina Padang), it was reverted back to a normal trunk route in 2009. During festive occasions like National Day and New Year’s Eve, the Marina South area is a popular place for fireworks viewing and celebrations. 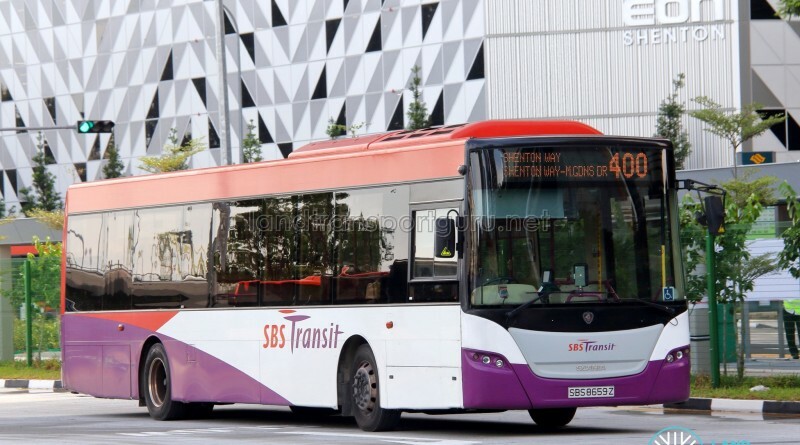 Buses will be added to cope with the large increase in passenger demand. 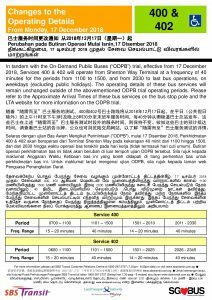 To facilitate the ODPB Trial from 17 December 2018 to 14 June 2019, Service 400 operates at a frequency of 40 minutes during off peak hours on Weekdays (Except Public Holidays). 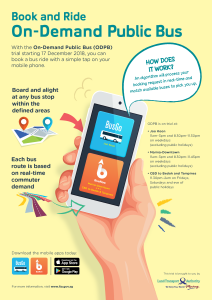 Commuters may book an On-Demand Public Bus (On-Demand Public Bus – Marina – Downtown Area) through the BusNow app. 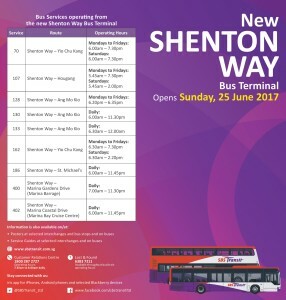 1989 (30 Jul): Introduced as Shenton Way – Marina Mall (Loop), operating on Sundays and Public Holidays from 1400hrs-2300hrs. 2009 (15 Mar): Reverted back to trunk service. 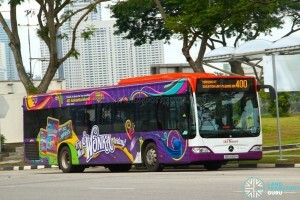 2009 (19 Jul): Amended to Marina Gardens Dr (Marina Barrage), no longer serves Marina Grove, Marina Place & Marina Way. 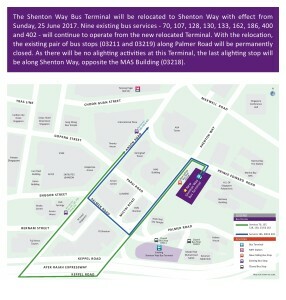 2012 (24 Jun): Amended to serve the new Marina Gardens Dr (along Gardens by the Bay) instead of Marina Mall.